Have you ever wondered what it’d feel like to stroll around town in the Edo period (17th-19th century)? 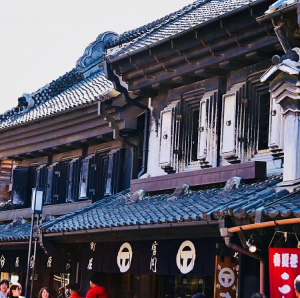 Well, wonder no more, because the town of Kawagoe, also known as “Ko-Edo” (which translates to “Little Edo”), has preserved the Edo-period ambiance quite well, with its main street and several houses looking as they did back then. It’s a nostalgic town completely different from the urbanized Tokyo. It is a place less busy and boisterous, but more tranquil and relaxing. It was just on a random day that I decided to visit Kawagoe because it’s not that far from Tokyo. Also, it’s one of the most popular day trip destinations for people who want to go on a short day trip near the metropolis. So without any hesitations, I went to check out Kawagoe, or “Little Edo!” I was so excited to see what the area had in store. The weather was perfect during my visit. It was sunny and the sky was clear. After walking around, I finally found a few shrines before arriving at the main street of “Little Edo.” The main street is called Kurazukuri which literally refers to a type of architecture for warehouses that is characterized by steep tiles and fire-resistant clay walls, which merchants sorely needed after a great fire destroyed Kawagoe in 1893. I got this information from the guide map I got from the station. Also, it’s about 15-30 minutes walk from Kawagoe or Hon-Kawagoe Station. According to the guide map, the street has more than 200 kurazukuri houses, many of which have been converted to shops and restaurants. Some shops sell traditional crafts and handicrafts, which make for nice souvenirs, and some of those shops even have pottery and glass-blowing workshops. The street itself was wonderful and picturesque. I love the Edo architecture, and the stores had lots of unique and cute things, many of them handcrafted. There were a lot of free tasting going on in some shops selling local treats – all sweet potato flavored, which was especially delicious. 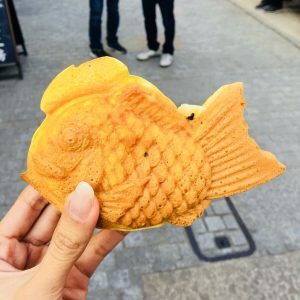 Fish waffle with sweet potato filling. Very sweet! 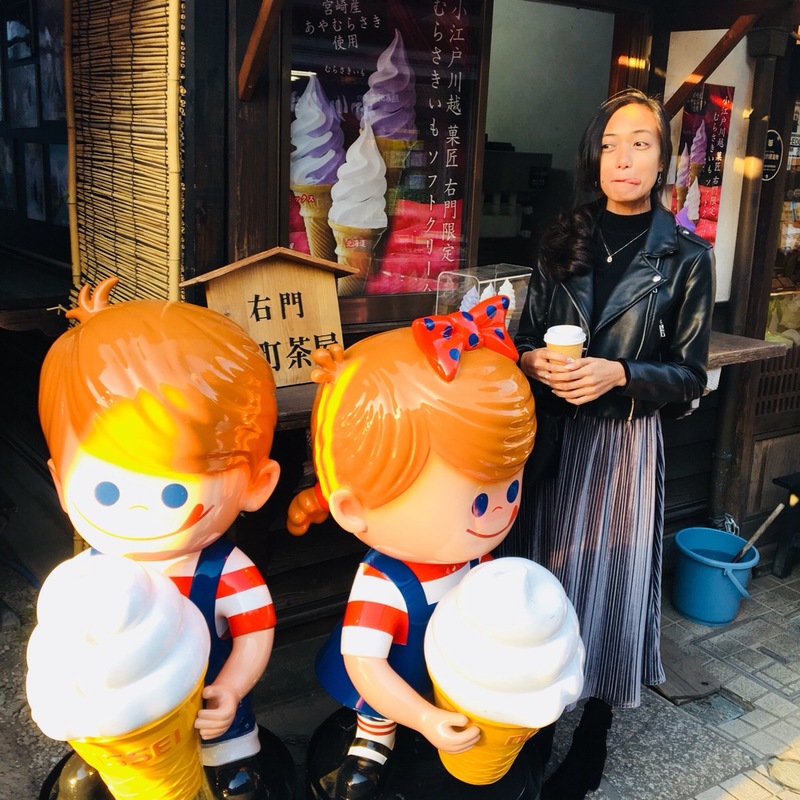 There is also a street called “Kashiya Yokocho” that offers a sense of nostalgia with its alleyway atmosphere and aroma of low-priced sweets, mostly kiddy treats. 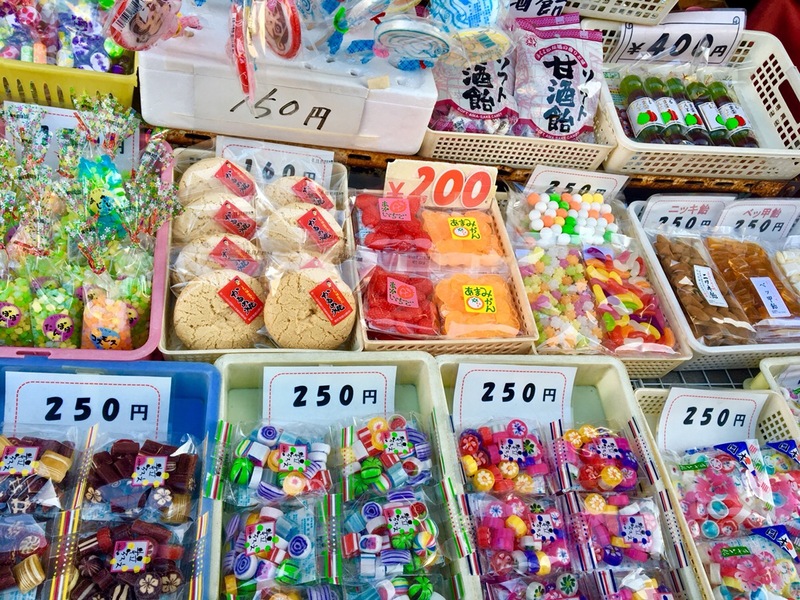 The area is lined with over twenty appealing establishments such as shops that preserve traditional methods of candy-making and shops that specialize in “potato sticks” made with local Kawagoe sweet potatoes that are cut, fried, and salted. Kurazukuri Street’s most famous symbol is a bell tower called Toki no Kane, which translates to “Bell of Time.” Standing at 16 meters high, it was used to tell time back in the day, and now it still rings 4 times a day: at 6:00 am, 12:00 pm, 3:00 pm, and 6:00 pm. It took me some time to find a good restaurant because I arrived there late in the afternoon, that means, almost all shops are closed and will reopen at 7PM! Luckily, fate brought me to a narrow street just at the back of an old Edo-styled house. 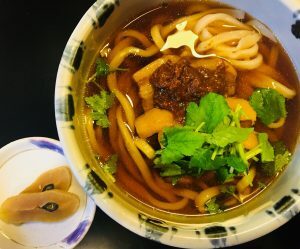 I found a pretty stylish “udon” restaurant which has pretty good reviews online. So, I gave it a try! I’m not a big fan of “udon” but it was very delicious! It was a fun day and a lot of walking. 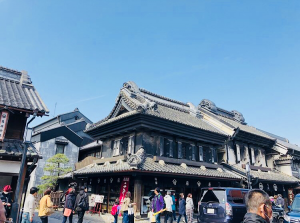 Kawagoe is such a great place and it surely lived up to its name, “Little Edo” because it is totally reminiscent of the Edo era. I will definitely come back. 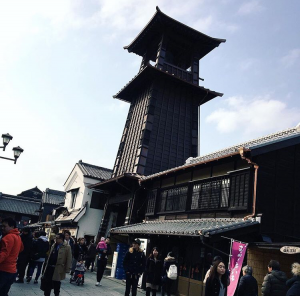 Have you visited Kawagoe? If not, then you should!